Charles Ross & Son Company, Vice President of Corporate Operations, Joe Martorana announces the relocation of Ross Process Equipment (RPE) into a new state-of-the-art plant in Pune, India tripling the size of its previous facility. A fast growing company, RPE manufactures many Ross product lines including Tumble Blenders, Ribbon Blenders, Planetary Mixers, Multi-Shaft Mixers, High Speed Dispersers, High Shear Mixers, as well as pressure vessels, tanks and other fabricated equipment. Fully supported by US-based Ross engineers, RPE designs and builds Ross equipment based on standardized technology and quality control measures. Ross's 170 years of experience in the niche market of specialty mixing and blending equipment makes it a unique resource of technical know-how. Ross operates five other manufacturing facilities in the US and two in China. RPE is the company's newest venture which opened in 2007 to service the process industries in India and the neighboring Asian countries. 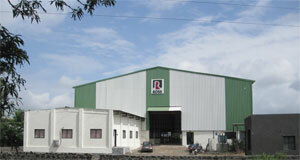 The booming market in this region has driven the rapid expansion of RPE.